A Good Employee uses TeleCheck Check Verification Service to track a job applicant’s history of check writing. This is an invaluable report used by employers to assess the likelihood of future fraud or company theft. 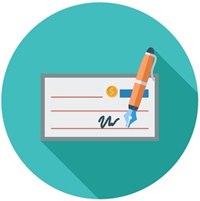 Bad check writing history is information that is not available in a credit history report and also does not show up in criminal records unless the person has been sued for fraudulent check writing. TeleCheck has been a leading check processing and risk analytics service for the past 50 years. By maintaining a live database of fraudulent checks reported by hundreds of thousands of merchants, TeleCheck check verification can pull up an individual’s check writing history. Their database automatically identifies patterns of invalid check transactions to give a general assessment of a candidate’s financial trustworthiness. Their 50 million+ bad check records offer the most comprehensive method for identifying current or previous fraudulent check activity. This is incredibly useful for safeguarding your company from theft, especially if your future employee will be handling company finances. It is provided instantly and included in every A Good Employee reporting package.